Try Dove Men+Care Clinical Protection Clean Comfort Antiperspirant for a clinical strength Antiperspirant for men that will give you up to 48-hour powerful odour protection. It delivers long-lasting protection against body odour and wetness and, as part of the Dove Men+Care range, it’s specifically designed to care for skin. 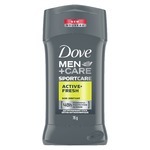 Its unique formula, with ¼ moisturizer technology, gives you all the strength and care of a Dove Men+Care Antiperspirant. It helps to combat odour for up to 48 hours, and its subtle scent will leave you feeling fresh all day long. Swipe it up and down each armpit several times to dispense an even layer across your skin. Use it in the morning and at night for maximum protection at all times. The clinically-tested soft solid formula works overnight to form a deep level of protection that lasts throughout the next day. It’s tough on sweat, not on skin. I love the scent of this and it keeps me feeling dry and fresh all day. I am a big fan of Dove products and this one does not disappoint, same great quality at a great price point. Originally got this antiperspirant for my husband to try because he's an excessive sweater and looking for an antiperspt that works. He however didn't really like the scent of it, so I used it. I don't really sweat but found it worked well on my stinky days! I liked it. Finally a Stick that delivers! 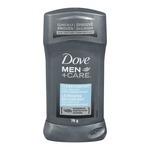 I bought DOVE MEN+CARE CLINICAL PROTECTION CLEAN COMFORT ANTIPERSPIRANT Stick for my husband. He is very active and his type of job makes him sweat buckets! This is the first antiperspirant that not only cut down the sweat but left a fresh scent as well! I would definitely recommend it to active men or even for those who suffer from stress sweat! Great product! I really appreciate the clinical strength products! Especially during the summer months. I really enjoy the smell too. This product is very effective. This is a very nice deodorant. Helps keep the sweat odour away for hours. Its easily available at alldrugstores and its a Dove product so u know its a good quality product which works. I bought Dove Clinical Protection Clean Antiperspirant for my boyfriend to try something different than AXE which is the only Drugstore Brand he would use and he's addicted to it and won't use anything but the Dove! It smells very clean and fresh which he and I both love. Living in Florida it gets very hot out and its great he found a new and affordable Antiperspirant that works wonders, smells fresh and clean and stays throughout the day. He has already purchased two cans of Dove Clinical and has no intention on stopping. Dove is an all around great brand with many great products. 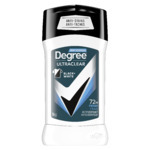 This deodorant works wonderfully if you have sensitive skin! 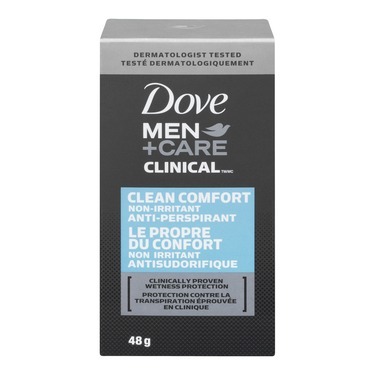 I bought this product as my son was having a hard time with his skin related to deodorants he had used, within a week of using the Dove-Men Clnical Deodorant he noticed a huge difference and was my happy boy again!! It is well worth the little bit of extra money to have a happy, NON-irritated armpit boy!!! Woohoo will definitely buy this product again!! I loved this deodorant! Very neutral smell which is excellent for my work that has a "scent free" policy, but excellent protection for odours. I like how quickly it dries and I never noticed any stains on my dark shirts. 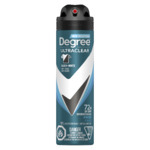 Price is fair for the quality, I wish there was more product but it lasts longer than normal deodorant even though you get half the weight. I really love this product. Its targeted towards men but as a woman I find it as my go to product. It keeps me dry and smelling nice all day. The texture is nice and not gritty as some can be. I find it doesnt stick to my clothes which is nice.